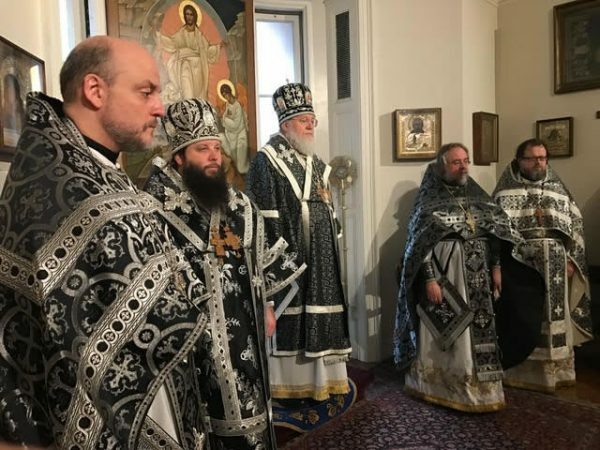 On Wednesday, March 1, 2017, known as “Clean Wednesday,” and the feast day of St Macarius (Nevsky), Metropolitan of Moscow and Kolomensk, Apostle of Altai, His Eminence Metropolitan Hilarion of Eastern America and New York, First Hierarch of the Russian Orthodox Church Outside of Russia, prayed during divine services at the Synodal Cathedral of Our Lady “of the Sign” in New York City. The Great-Lenten matins, hours and typika were performed. His Eminence then officiated at Divine Liturgy of Pre-Sanctified Gifts. He was joined by His Grace Bishop Nicholas of Manhattan and the clerical members of the Synodal administration and clergymen of nearby parishes. During the Eucharistic prayer, after partaking of the Holy Gifts, the First Hierarch read the customary teaching of St Theodore the Studite. After the services, Metropolitan Hilarion congratulated everyone on the first Liturgy of Pre-Sanctified Gifts of the year, wishing them Divine aid in their Lenten journey and the salvific welcoming of the Pascha of Christ, after which he offered his blessings.